Corruption can take many forms and in relation to the Ombudsman (PHSO) the corruption referred to is ‘systemic corruption of purpose’. A generic definition of an Ombudsman as supplied by Wiki: An ombudsman, ombudsperson, ombud, or public advocate is an official who is charged with representing the interests of the public by investigating and addressing complaints of maladministration or a violation of rights. Yet here in the UK our Ombudsman does the very opposite and represents the interests of the state against the public. This article will provide evidence that from the very inception and throughout various amendments the UK Ombudsman is #corruptbydesign. Systemic corruption (or endemic corruption) is corruption which is primarily due to the weaknesses of an organization or process. It can be contrasted with individual officials or agents who act corruptly within the system. Factors which encourage systemic corruption include conflicting incentives, discretionary powers; monopolistic powers; lack of transparency; low pay; and a culture of impunity. Sweden is the birthplace of the modern Ombudsman initiating their Parliamentary Ombudsman in 1809 “to safeguard the rights of citizens by establishing a supervisory agency independent of the executive branch.” No doubt many citizens needed such safeguarding in the UK at that time but it took the resignation of a Cabinet Minister in the Crichel Down Affair of 1954 to persuade the British Government to adopt the Ombudsman model. This scandal culminated in the first resignation of a Minister since 1917 and was marked by a very public scrutiny of a Minister carrying out his discretionary duties. The motivation for the creation of a UK Parliamentary Ombudsman sprang from a desire to protect Ministers and not a desire to protect the public. A failure to include discretionary decisions made by Ministers or government departments for scrutiny by the Ombudsman or by other means. A failure to define ‘maladministration’ leaving it to the Ombudsman’s discretion on a case by case basis. A failure to provide direct access to the public forcing them to appeal through their MP who can decline their request. A failure to give the Ombudsman powers of coercion over public bodies. A failure to make the Ombudsman accountable except by judicial review, beyond the means of most citizens but within the means of public bodies with funded legal teams. The Whyatt Report, The Citizen and the Administration: The redress of Grievances.’ (1961) written after the Crichel Down Affair, Whyatt quite rightly determined that much injustice was delivered to the citizen due to the inappropriate use of administrative discretion and that independent tribunal was necessary for public redress. Failure to act in a timely manner or failure to take the most appropriate action is often described in public inquiry reports as ‘missed opportunities’. These actions undoubtedly led to the ensuing disaster, but often fail to be judged as maladministration. When policies and procedures are only guidelines, proving maladministration is extremely difficult. There is rarely a smoking gun, more often a trail of error and ineptitude. Providing the opportunity for citizens to seek redress for poor administrative decisions through independent tribunal was always more likely to provide redress than the cumbersome investigation process, yet this key aspect of the Whyatt report was never implemented. The debate in the Lords in 1967 identified the difficulties with providing redress when there was no clarity over what constituted ‘maladministration’ and therefore within the remit of the Ombudsman and what would be determined as ‘discretionary decision making’ and consequently beyond scrutiny. The government paid no attention to the debate in the Lords and in fact set up the office of the Parliamentary Commissioner before the debate took place. Maladministration has never been defined and can be anything the Ombudsman considers it to be, offering no consistency or predictability. Discretionary decisions are still beyond the remit of the Ombudsman and it is for the Ombudsman to decide which evidence falls under such heading allowing the Ombudsman to ‘cherrypick’ the evidence. The MP filter has not been removed giving Parliament continued control over access to the Ombudsman for Parliamentary complaints. There has been a failure of parliament over 50 years to reform the Ombudsman which was originally considered to be something of an ‘experiment’. Despite much debate on the inability of the Ombudsman to serve the public those in power have consistently failed to reform this body knowing that the inefficiency of the system serves to protect them. Recent draft proposals for reform serve to further disable the Ombudsman from upholding complaints. It is clear from this proposal that parliament has no intention of removing any of the barriers to justice and in fact, clause 8 effectively nullifies the Ombudsman’s investigative process by negating any requirement on public bodies to act on the findings of an Ombudsman’s report. Although the Cabinet Office drew on a report entitled ‘Better to serve the Public’ the proposal ensured that the public would continue to be stymied by allowing the continuation of the following flaws in the legislation. The Ombudsman must determine harm caused by maladministration when there is no definition of either term and the Ombudsman has the discretionary powers to decide that the harm would have occurred in any event, leading to no uphold. The Ombudsman investigates in secret resulting in neither party being able to influence the outcome by challenging false evidence or assumptions. The Ombudsman is under no obligation to apply statutory regulations but can decide which regulations to apply on a case by case basis without challenge. The Ombudsman can determine which parts of a complaint to investigate and which to ‘scope out’ of the investigation without challenge from the complainant. The Ombudsman can continue with an investigation even when the complainant loses confidence and withdraws from the process. This can produce a flawed report which effectively prevents the complainant taking legal action. The Ombudsman can only investigate the complaint when the designated authority has had a ‘reasonable opportunity’ to carry out an internal investigation and respond. The ‘reasonable opportunity’ is not time-bounded and can continue for years wearing down the ability of the complainant to pursue the case. It gives the authority under investigation every opportunity to review the evidence and gather legal advice before the ‘independent’ Ombudsman investigation takes place. Evidence can and has been removed, destroyed or altered. “In no other area is one party allowed to have complete control over evidence that might prove the complainant’s allegation while the other party has to beg for access to information.” control of the evidence – Telegraph article 2013. There is no requirement of the Ombudsman to hold evidence for longer than 12 months. Evidence is then destroyed making it impossible to detect repeated patterns of offence. All complaints about the Ombudsman are handled internally by the Ombudsman themselves. No external scrutiny. There is ‘free-flow’ of personnel from government departments into management positions at the Ombudsman’s office. Amanda Campbell moved from the Home Office to become CEO in 2016 and in 2017 Rob Behrens moved from OIA (technically a charity which monitors complaints about higher education) to become the new Ombudsman. The board has no powers of control over the operation of the Ombudsman. Returning to our definition it can be seen that the Ombudsman has conflicting incentives as it is funded by parliament, with key appointments through parliamentary bodies and meets regularly with government departments such as the Cabinet Office and Department of Health. It also has no powers of coercion over the public body ‘stakeholders’ so must negotiate with them for compliance. ombudsman-to-public-bodies-please-do-as-i-say The Ombudsman has significant discretionary powers which make legal challenge virtually impossible for members of the public. The Ombudsman is the only body who can investigate parliamentary and health complaints giving it monopolistic powers. There is a significant lack of transparency with secret investigations, no external review of the investigation processes or outcomes and a failure to release meeting minutes into the public domain. No new case studies have been placed on the website since 2015. There is a culture of impunity as it is impossible for a member of the public to hold the Ombudsman to account either by direct complaint, appeal to parliament or appeal to the criminal justice system. The Ombudsman meets virtually all of the factors for systemic corruption. This systemic corruption of purpose is a national disgrace and should cause a public outcry but the situation is unlikely to alter while those in power are protected and many others exist to fill the void and by default benefit from the failure of the Ombudsman and the public complaint system as a whole to deliver justice. Previous Previous post: PHSO and the mystery of the Round Table. Next Next post: When the Ombudsman gets it wrong – who defends the complainant? Give people the vote and if they vote Brexit then spend two years trying to convince them they were wrong! If that doesn’t work then tell them they will all lose their jobs and the Chancellor will need to sort out a special punishment budget! If that fails then have MP’s decide we were all stupid and need to vote again! If that fails don’t worry – we can disguise leaving the EU and the single market and the UCJ by agreeing if we don’t get a proper plan to avoid a border in Ireland then we should let the EU not let us leave. OH DEAR – people have figured out the plan – OK last resort : create an independent body something like the Ombudsman to decide when it is right for us to leave! OK sounds a good idea but now what should we do? I know let us put Anna Soubry in charge of signing off the deal for the independent body when the time comes to leave. To doubly prevent thoughs upstart members of the public from getting what they want : you know them 17.4 million voters that wanted to leave the most corrupt organisation on the face of the planet! Well other then The UK’s Ombudsman Service of course! YES THATS THE GUY – KENNETH CLARKE – Father of the House! Excellent report. But will it take somebody like Gina Miller with a lot of money to take the issue to the Supreme Court in London or a Human Rights Lawyer like Cherie Blair to the Human Rights court in Brussels. The PHOSO has worked it way through hundred of staff and a number of CEO to prove just how hopeless and incompetent it really is. Yet NHS Trusts GP.s and all other bodies involved in healthcare still recommending the PHSO as the final arbiter in a complaint. In the full knowledge that their cover up will be covered up. Only the public, the victims of this corruption of purpose are rallying for change. It seems to suit everyone else who make a living by endlessly talking about putting things right or who mop up with litigation claims. Let’s hope PHSO’s ears are smarting after reading this. It’s just beyond embarrassing now. They put someone new in charge but nothing changes, just more empty rhetoric and window dressing. Actions speak far, far louder than words. The public has to feel absolute rage about how much of our money is being misused this way. Investigations cost a fortune (never mind the manipulation of the value for money report) and for what? When Mr Behrens looks himself in the mirror, does he smirk at the manipulation and abuse his organisation is guilty of, he has to recognise it. Or did he really go into it naively believing his own claims and is there any chance he will look in that mirror with a slowly dawning realisation. Even with so-called “historic” complaints, complainants seeking justice and remedy should be treated as valid current complainants and included us in all the improvements Mr Behrens claims to be making to PHSO. When PHSO accepts by default, lies told by public bodies to them, why is that? Is it misguided trust in these bodies? Or is it much more likely what it looks like, corruption. Likewise when PHSO begins working with these bodies to deny what complainants are telling PHSO, in the face of evidence. In this day and age, with the internet, you can’t hide this stuff any more and there is so much negative stuff online about PHSO now, it’s not just a losing battle to remedy what Julie Mellor did, it’s a losing battle to maintain the pretence any longer in the face of PHSOs continued corrupt actions. An excellent article, superbly written and just as it is…. crystal clear. How much longer can PHSO hide the truth and cover up? How much longer can innocent, trusting citizens be led down this path? Brilliant account of the current state of play showing how the PHSO is irrefutably and deliberately corrupt by design. This should be required reading for PHSO staff, PACAC members, and anyone with an interest in the PHSO or the complaints system. Donna , I have signed your petition. How do we get wider publicity on this ??? ‘PHSO Scrutiny ‘ by Mr Jenkin MP and his Select Committee colleagues on PACACsc. Remember previous PHSO Dame Julie Mellor covered her deputy Mick Martin’s indiscretions yet stayed in post until current PHSO Mr Rob Behrens was appointed. My personal experience supports this article. The PHSO was recommended to me by my MP several years ago, but the resulting ‘report’ following their ‘investigation’ is a piece of blatent fraud. The PHSO continue to refuse to reflect the actual facts for a resultion which also means no learning takes place, as they advertise. Yes I think this would be a firm basis for a group submission to the UN and perhaps supported by extremely brief individual experiences to reinforce. Having being kept in utter stress -entirely consciously- by the PHSO and NHS partners-in-denial, other services have again provided access to medical assistance to help cope with effects of PHSO abuse over 10 years of asking what was due. Only after the PHSO agreed to examine service complaints and the last offensive and prejudiced report (taking 28 months in total), I discovered NHS Trust BSMHFT had lied to PHSO in 2015 with regard to my son’s demise and, on top of that, had demanded the PHSO report was altered in their favour. This is not Building Trust or Caring in action – it is cynical and serious maladministration which continues, permitted still: and mainly the PHSO’s failing, since it could have oversight of new and historical data. This is the ‘gold dust’ (a reference back to the PR spin -the defence- of a previous PHSO) that was consigned to trash after use “for privacy and security” purposes, or lest patterns of negligence were tracked then reopened to discover and admit what went wrong. Further; why is Government Office and Treasury supporting this charade of a service? People are dying for an ethical and value service which stands on human and government principle. Imho, and experience. I will now be bold enough to state that, judging from my experience with this worthless process, the arrogance and cynicism of PHSO is to a great extent the REASON that the UK has walked blindly into it’s current Mental Health crisis, where even complainants are tormented, bludgeoned and crushed into giving up with PHSO for the sake of their own health. Peggy Ruth Banks. It is quite clear that elected politicians in Westminster are quite content to continue to allow people to suffer bad treatment by the NHS and then have it covered up by the PHSO. The European Court of Human Rights or the United Nations is an increasingly obvious place to go for a hearing without prejudice or cover up. I am permanently disabled because of medical negligence and many of you have suffered family deaths without explanation of the cause. Can we somehow join up and get going on this. ?? We have approached the ECHR before on this matter John and they informed us that we needed to explore all the systems available in the UK before they would consider taking on our complaints. That means taking PHSO to the High Court and as members of the public that is beyond our means. The UN can only investigate if invited to do so by the Government and I don’t think that is likely after the damning poverty report. It is all sewn up John and a whole lot of back scratching is going on between all these bodies. annex: Why no public outcry? Year after year maladministration and negligence at the #PHSO is witnessed and evidenced, but excused ‘on a promise’ to do better. This cannot be solved by more PR, more distractions and more shutting-out Complainants’ horrific stories. PHSO perversity and peripheral procrastination has to be reformed from the top down. Why are so-called solutions tactically ‘engineered’ by government services to look look some sort of fix, when authentically engineered solutions are so far from the understanding and competence? This has to be hastened, because again nobody is seriously listening, in a ‘jobsworth’ culture. The above is my view, but my experience is fact. You are right of course. The solutions are always carefully controlled to be ineffective in dealing with the core issues. Just more window dressing. The Ombudsman works very well for parliament and the public bodies and as for the citizens – well – they don’t matter. The coverup does indeed wreck lives. It destroys your trust in authority forever and the helplessness engendered by authority collusion and denial often leads to depression and PTSD. But what do they care? Good luck with your quest for accountability. Luck does not come into it. Perseverance, Patience and research using GDPR are slowly bringing answers. My son Nick died through negligence at BSMHFT 10 years ago. 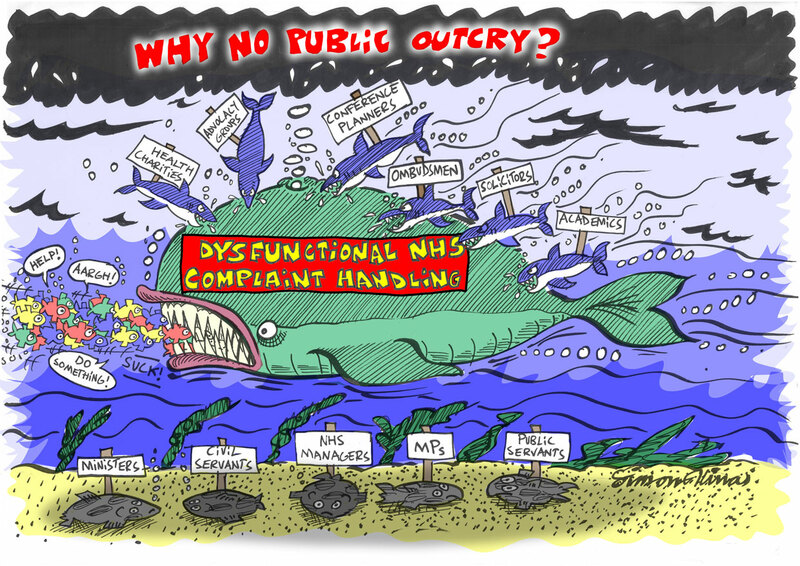 The PHSO has been unable to appreciate the events that led up to his avoidable death and now new information has shown that not only does the Ombudsman use NHS lies unchecked (copies retained), it also readily bends to NHS demands for Outcome changes, even when it’s letting them off with a potential manslaughter. They know this. Now I know. When the NHS is ‘not happy’ with ‘Outcomes’ they just get it changed to something ‘more acceptable’ to agree with. There’s a sort of buddy-bartering which goes on, to ensure nobody gets hurt except the victim. Plus future patients of course, but at least jobs are all kept. When a victim is ‘not happy’ with an Outcome all they get is ‘very sorry you don’t agree with us’ i.e. go screw yourself in words to that same effect, even when PHSO is fully aware of mental oppression they’ve dealt out up to that point. This may be the best way to shut them up forever and PHSO knows it; it’s a game to them. In my case now x10 years of that same treatment. Secretive; inept; ignorantly corrup; abusivet. This is the PHSO today – and maybe worse than ever. I have now seen that they actually ‘tag’ victims (complainants) records to indicate “No new evidence to be taken. Put down the phone on this caller”. I wonder how many other bereaved and secondary PHSO victims have seen the same behaviour? Life wreckers – but keep the ship heading for the ice. imo. It’s makes you wonder how many new complaints are people suffering the same harm as those who have been dismissed by PHSO. Donna raised a petition and so far only 486 people have signed it. If WE want Parliament to take notice of US it needs 100,000 signatures. So what are you each doing to promote this petition. ??? Hi Denis. See you have been given the runaround by PHSO. Want to join the group and be part of the fight back? If we do ‘Brexit’ will we be able to use the EU court of Jusice? If so, could we apply to them saying all routs here are blocked by our own Gov? If we can prove bias by PHSO their get out is their discretion, so back to Gov which has blocked us again. Brenda Brexit will not affect our rights to go to EU court of justice. But as far as I am aware nobody has done so to date. I also not that the petition started by Brenda only obtained 635 votes. I signed the AGE UK petition about tv licences for over 75s and it was presented to Parliament last Thursday night. Surely death or maiming by NHS is more important than free TV .licence . Which Brenda was that John? For the record and to be clear, so far, I haven’t started any petition. Brenda. On 21st. November 2018 “Donna” posted on this thread her petition to Parliament . Which I signed and reminded people on this thread twice. The petition was closed after 6 months because of lack of signatures ! Arrrr Donna not me then. The reason people can’t go to EU easily is, all avenues in the UK must be followed first, expensive. Brenda. Apologies for getting name wrong. It costs nothing to sign a petition. The petition about tv licences was presented to Parliament for consideration last week. Surely there must be at least 100,000 who have had problems with the PHSO and the NHS . Absolutely agree, tv can be paid by most if planned for, saved for…. if you think it’s worth it…..
petitions are signed ( hopefully) by those who see them….. I myself do miss them sometimes! Brenda Are there as many people affected by flaws in the NHS as those who are currently demonstrating about climate change. I suspect there are more people affected by problems in the NHS and the PHSO than anybody could ever realize. Yet a 16 year old Swedish girl now has the ear of the politicians and and thousands block the streets all over the world. It seems that lying down and pretending to die in a museum gets get far more publicity than the real thing. Sadly ranting and commenting on the internet has no impact whatsoever. I notice that the “Patients Association” are being positive have started a training scheme for NHS trust on how to handle complaints competently . Media Publicity of the multiplicity and level of problems is sadly lacking. How do we get the media interested. ! Media coverage is controlled by the state. They decide where the spotlight lands. For years they have ignored climate change demonstrations but we have reached a tipping point and it is in their interest to use the public concern put change on the agenda. It is unlikely that we will ever be in a place where it is in the state interest to put in better measures to hold them to account. Hence no media coverage for us. It is also quite clear that if “the state” had any interest in gagging media comment they would close down this site. “The state” as we know it in our own the political system is disappearing before our eyes, as people like Anne Widdecombe former Tory minister join up with the Brexit nutters and Parliament descends into chaos. Rupert Murdoch is the state. Murdoch is an Australian living in the US. with global media interests He has nothing to do with Government in the UK. The “state” of which is quite appalling ! Really? I think he might be able to pull a few strings John. Money talks.